Star Wars: The Old Republic | Tank That! And oh what a collector’s edition it is! There is a lot to be had in this package. All of this can be yours for $220 dollars US. (Update: The 220$ price was the conversion into US Dollars from the Euro price of 150. It has been confirmed that the box will retail for 150$ in the US as well. Making the North American box price a whopping 70$ cheaper than the European version.) This just rings completely as a cash grab to me. I have played this game in both the first and second testing phases and had every intention of picking it up and possibly picking up the Collector’s Edition. For no other reason but to get my hands on the Original Soundtrack that is included. However, that is now not only not a possibility for me financially, but I am now extremely wary of how the game is going to be handled as a whole. The game already has a number of game design flaws, that if nurtured could be fixed give time. I mean there is no game (no not even Rift although people like to say it) that launched a perfect game out of the box. Hell, Final Fantasy XI took over a year of Japanese retail before it was fit for a worldwide release. World of Warcraft had a horrible launch and look at it now. 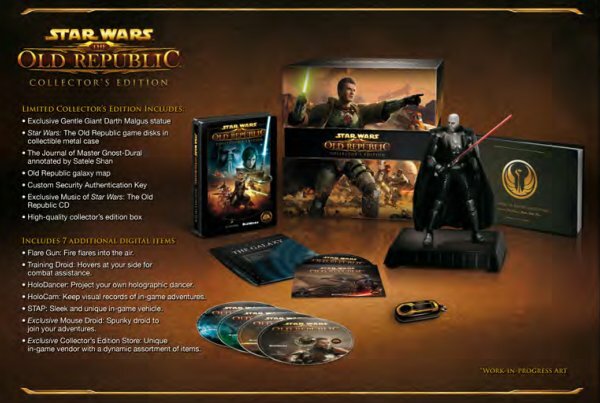 That being said, there is a lot of reasons to be extremely wary about Star Wars: The Old Republic just based on the in game items listed in this collector’s edition package. The Training Droid and HoloCam items are the ones that stick in my craw. These are both very different items, but they both reek of how the microtransaction shop will be handled for this game. EA is notorious for trying to milk every drop of money out of its playerbase and this just sits with me the wrong way. The Training Droid sounds like an in game item that functions somewhat like a companion. This may not be a hugely bad thing, as most classes get their companions between levels 6 and 10. So we can discount that one somewhat. Yet it leads to my belief that we will eventually see companions being able to be purchased through the cash shop. This goes beyond the cosmetic and “fun” and in a subscription based game model it is out of bounds in my mind. The HoloCam itself sounds cool. An in game way to record your gameplay. So instead of loading up that fraps application you “bought” you are given the opportunity to use an ingame tool (not unlike those mac wow users. Not quite sure why we havent ever seen the ability to record go to PC users in WoW but thats another conversation all together.) So this HoloCam would seem that it is another cash shop “item”. This time not a “power” issue but one that expands the functionality of the game’s client to include recording. This is not something totally out of the realm of paying for. However, with Rift doing its best to include screenshot and video recording capabilities embedded within its default client and WoW having this function at least available on some platforms out of the box, it would just be another sign that we are going to be getting an incomplete client for our money and having to pay for each separate feature we have become accustomed to getting within the package. Overall, the CE itself gives a lot of good stuff, but the pricepoint is $120+ too high. The physical items are all “cheap” to make and the ingame items do not live up to a standard to where they are worth an extra C-note. Hell, the CE for Uncharted 3 holds a very similar selection of physical items and a few interesting in game ones and is a much cheaper CE to buy this holiday season. Lastly, while this box goes up for preorders on July 21st, we can safely begin to assume that the game itself is set for what I expect to be a late September/Early October release date. Putting it smack dab in the middle of a WoW content cycle and beating Tera to the punch by several months. Both of which are good news for the games prospects. Now if only they could make the game actually look good graphically they’d win over a lot more people. You are currently browsing the archives for the Star Wars: The Old Republic category.